This Easy Whoopie Pie Cake is an instant favorite..filled with delicious Marshmallow Buttercream! So this post is gonna be simple. This Whoopie Pie Cake was sort of accidental. Obviously not accidental in intention, but accidental in execution. See, I was going to make this a super fancy, stack-o-whoopie pies piled up to make a giant gorgeous deconstructed type cake. Unfortunately, ain’t nobody got time for that. Meaning me. I ain’t got time for that. So I took the easy route. It might not be as visually appealing as a giant stack of whoopie pies…I mean not much would…but it is incredibly tasty. And also, you can actually slice it without holding your breath. Which is kind of important, because I can only hold my breath for like 7 seconds before I’m certain I will faint. Just start with a chocolate cake mix. Listen to the directions, then add an extra egg. Grease 2, 9×13 pans with butter and dust with cocoa powder. 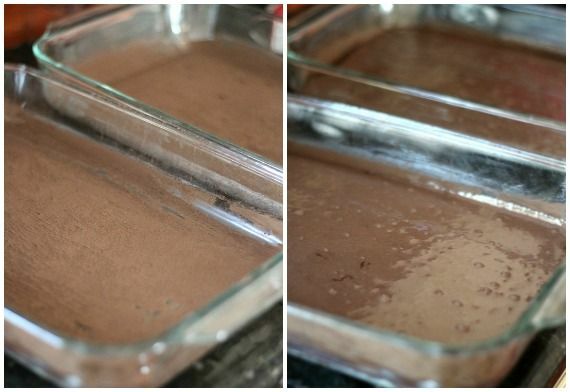 Split the batter evenly between the 2 pans. When the cakes are done, allow them to cool completely. Spread it out evenly, and place the other cake on top. Next make your chocolate ganache. 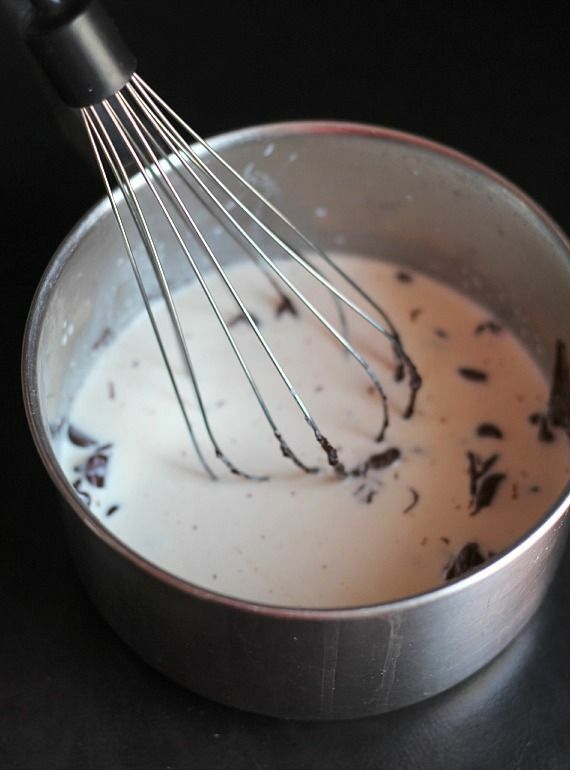 Just heat up some heavy cream to almost boiling and then add in your chocolate chips, stirring until smooth. Spread it to just about the edges of the cake and allow it to drip over the sides for dah-rama. Let it set up a little bit and that’s it y’all. i love giant versions of other desserts. The only problem is that i convince my self, i am only eating half when i am eating half a batch! Great idea for a crowd! The marshmallow filling looks dangerous! I fear that I might eat it all before putting it on the cake!! Yum! I could eat the filling by the spoonful! Say whhaatt? I want this cake so bad. It’s nuts. Oh wow! … I hope my hips will forgive me. Love this! Also ‘dah-rama’ might be the best word ever. Making this to celebrate the end of budget season @work!!! YOUZA! I think I have died and gone to heaven…Yup, heaven! I will make this cake- the boozy version, of course!! Wow that looks great! I like that you “added a little fancy” into a simple cake mix! Wow this looks so easy and amazing at the same! Love it! I think this looks FABULOUS! 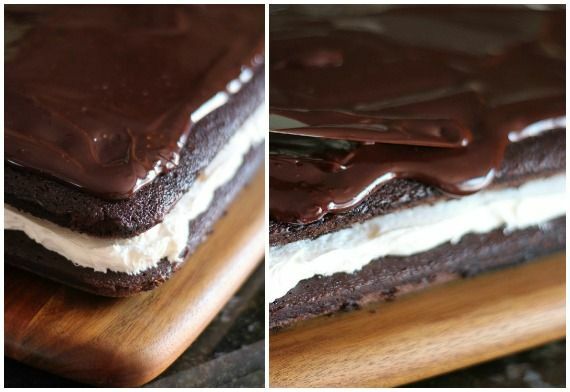 Two of the best things ever, simple chocolate cake and a whoopie pie! My kids would love this because they are all about the icing! So fun! This looks awesome! I am definitely going to try this, my kids will flip!! P.S. 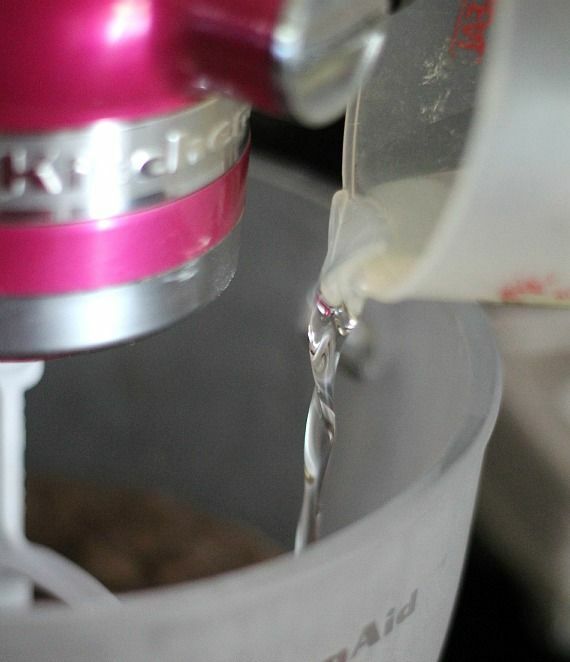 I am envious of your hot pink mixer! I work at a restaurant and always bring the staff treats on the weekends. Guess what they are getting this weekend. Think I’ll make in the round pans to look like a giant whoopie pie. Thanks for the idea. Gayle that is such a nice idea for your staff. You must have a wonderful staff & they really care a great deal for you. Hope your giant woopie turn out good. I have to try this recipe. It looks too yummy to pass up. Can’t wait to give it a try. This looks so yummy!! Thanks for sharing. Yeah that filling sounds pretty dang fab! MMMM whoopie pie cake! Sometimes when you don’t have time to make a fancy dessert, you end up liking your more simple version anyway! I’m having one of those days….no, scratch that. I’m having one of those WEEKS when a decadent whoopie pie cake like this could really make the sun shine a little brighter… Soooooo…wanna fly one across country for me? Pretty please? 😉 Seriously, this is just crazy awesome, Shelly. This looks delicious!! 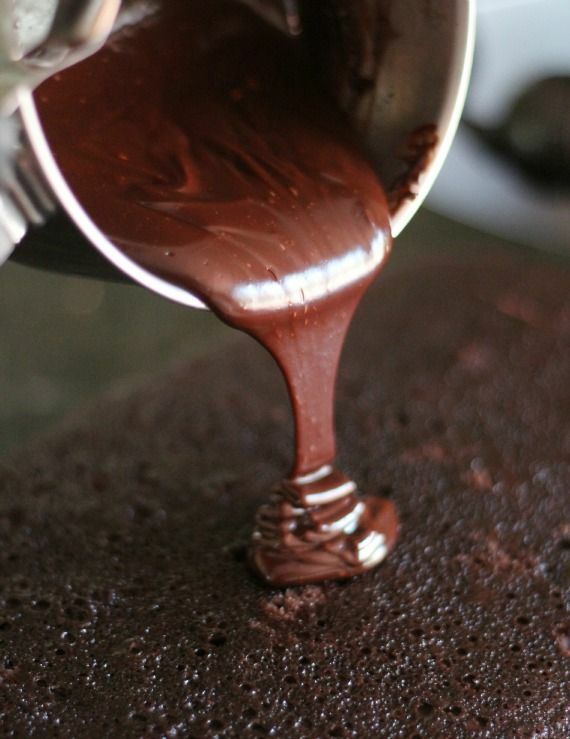 Do you use a cake mix with or without pudding in it? I do love me some crazy layer cakes…but sometimes I also just want two chocolate layers with some vanilla sandwiched in between. This cake is perfecto for that! Simple is always good and boy does this look awesome!! Perfect! Dont you just wish there was more hours in the day!!?? Never enough time! NEVER! Accident or not, this has my name all over it. This looks so amazing! I’m literally drooling on the screen. So, I’ve been eating marshmallow fluff out of the jar. It’s a problem. I’ve got to stop. The civilized thing to do is make a cake and eat it! Dayum… that looks sooo good. It seems so exquisite!! I repeat myself: favolous! Mmmm yes PLEASE. Ganache is definitely not optional in this house. ‘Scuse me while I pick my jaw up and off the floor. AMAZING! Oh yum-o! This looks so good! And so much easier than making individual pies. WOW! OMG! I WANT THIS! this could be the best thing I ever ate — made it in two 9″ pans, for Memorial Day picnic, and it disappeared so fast it left a cloud of dust (crumbs?) Thanks for a great recipe, it’s a keeper! You’re a genius, Shelly! Love it! Your whoopie cake looks awesome! What cake mix brand did you use? I want to bake this cake this weekend, just want to make sure I buy the same cake mix you used. Thanks! 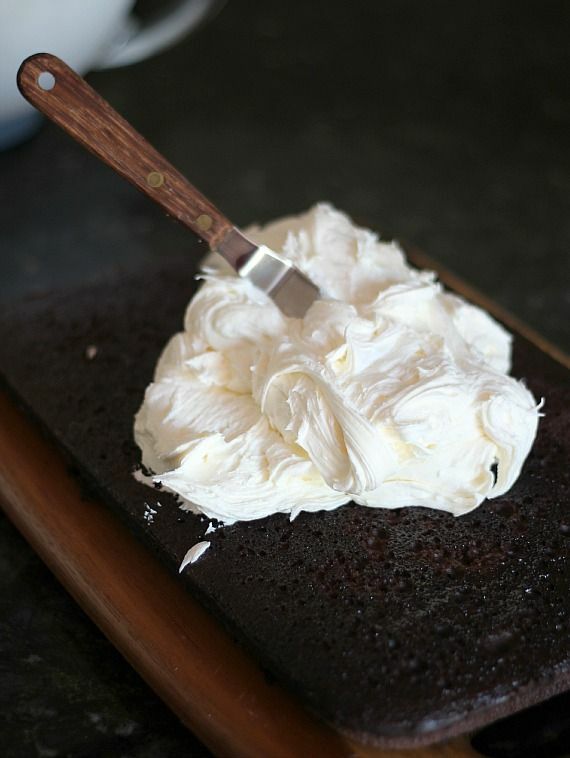 I am making your whoopie pie cake tomorrow for my beau’s birthday and I have every bit of faith it will be fantastic! He’s from Maine where whoopie pies are as necessary as breathing and when I found your recipe I jumped for joy. This looks amazing! I will try this recipe next!! Help! I so want this to be amazing, but I made it today and my “fluff” didn’t really fluff. Your picture looks white and fluffy and marshmallow-y. But mine came out sort of yellow (the butter) and too runny. What could I have done wrong and how do I fix it when I try again? Thanks! That’s odd…if it’s too funny just add more powdered sugar! Maybe your butter was too soft? Just a guess. This is absolutely stunning and GENIUS! Can’t wait to make it! Hello why kind of chocolate cake mix do u use? Milk or devils food? Is marshmallow fluff the same as marshmallow creme? I make Whoopie Pies all the time and I love this idea quicker and eaiser. One day I was making them and the Peanut Butter was yelling at me to mix in the filling….I used half fluff and half peanut butter and WOW it is amazing. thanks for the cake idea. why is the last pics cakes thicker than the pic on top did you double the recipe or is it the same? Not sure what you mean… it’s probably just the angle. it’s the same cake in all the photographs. This looks amazing! I am making it for Mother’s Day for myself…and all the family. Does it need to be refrigerated after it’s made? Thanks for sharing! I never refrigerate the cake, but if you did, it would be fine! I just finished swirling on the ganache. This cake will be a knockout at the 4th of July BBQ tomorrow! 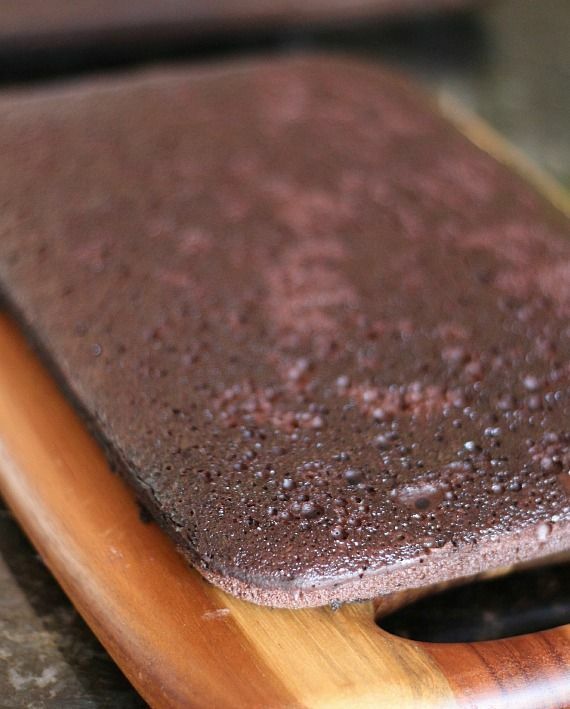 I used an 11″ X 14″ X 1″ deep cake pan to make the layers with parchment paper on the bottom. I followed the same cake recipe and baked it for 15-18 minutes. I wish I doubled the filling. The cake layers at this size have a bigger area. The current filling was plenty to cover it; I personally like more filling. Can’t wait to have a piece of this! Just thought I would let you know I got here by following a link fir egg free recipes, & this was not. Both my girls are allergic to eggs so I was excited to see this recipe noted as “not an egg in site”. Not only do boxed cake mixes call for eggs, but marshmallow fluff also contains egg as well. Looks great & yummy, but very disappointed, & just thought I would let you know in case others had allergies as well. What site referred you? For the most part I don’t really know when sites link to me. Sorry about the confusion on their part, but this cake definitely has eggs in it. This looks so yummy!! I can’t wait to try it!! This is the most delicious thing I have ever eaten, and is constantly being requested for family get-togethers! 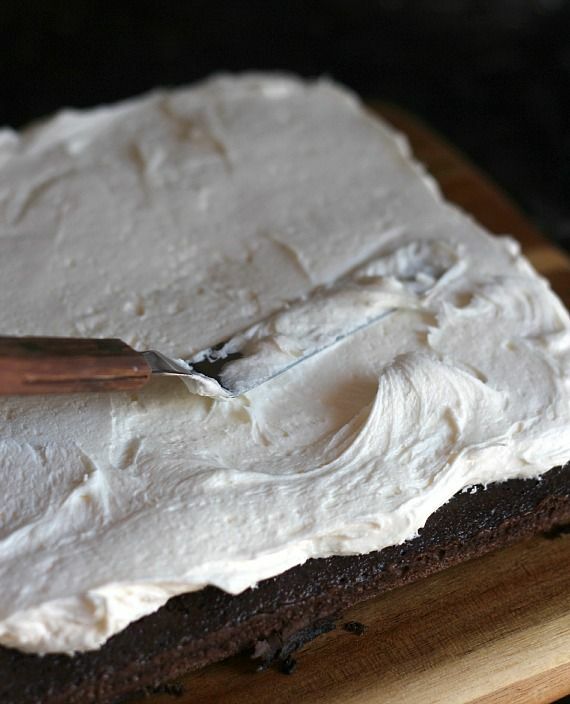 Marshmallow Fluff is made from Egg Whites – so this is not an egg free recipe. Many people with an egg allergy are allergic to the white! You’re right.. I do not claim that this is egg free in any way! I am going to try this gluten free. It looks delish! To Dani above me…. I have made the fluff without butter. Use Spectrum palm shortening. Use dairy free chocolate chips and the extra creamy thick part of a can of coconut milk in place of heavy cream or actually, you can use any non-dairy milk for the ganache. You, my friend, are a GODDESS!! I made this for the superbowl, it was only the 4 of us so I took some into work, now I have requests for it. I am making one today for an Eagle Scout work day but with fudge marble cake. Just made it. I can’t wait for dessert so I can dig in!! I want to make this cake this weekend and wanted to know if you can freeze any leftovers. There is just the two of us and my husband doesn’t eat a lot of sweets he usually only takes a taste and that’s it. Ummmm… Yeah…. So, I need this, now! This looks ooey, gooey, delicious! Made this today. The best cake I have ever tasted!! YUM!! Awesome!! So glad you liked it!! The recipe is provided at the bottom of the post. 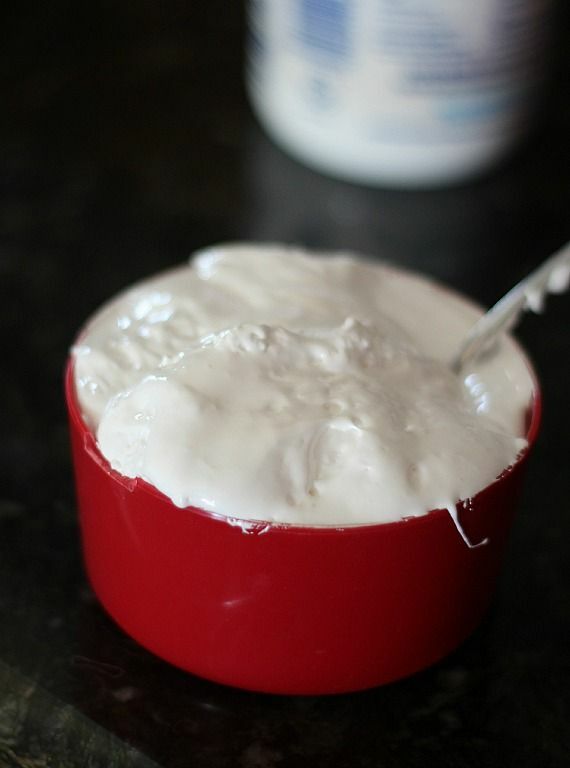 Marshmallow fluff is also called marshmallow creme in some places. It is a marshmallow flavored creamy stuff usually found in the baking section. is there a reason to bake two separate cakes? Could you bake one 9×13 and slice it in half? I realize it might be a little crumby that way, but any other reason? Thanks!! sure, you could do it that way! half and half will be fine in the ganache! Looks delicious & easy. Perfect combination. I’m so making this. Thank you. This looks amazing!! Can’t wait to make it this weekend. One question, would the filling still work if I only use 1/2 cup butter? Don’t get me wrong, it would be heavenly for sure…but I’m not sure my heart can handle that much butter!! Ha ha!! ha! yes, you could definitely try it, I am sure it will be fine. The texture will be a little different, though! Please email anything that good.looks easy peasy. Was wondering if you can use and hand beater. I don’t know how to bake and no one else in my household does, so I will just sit in the corner and cry. Don’t pay any attention to me. Thanks for the pictures and all of the posts. That cake, a gallon of vanilla ice cream and hot, black coffee would be the perfect day before death for me. Thanks. We have a 14 year old border collie and wanted to celebrate her birthday. My niece suggested we choose a dessert that was black and white to go along with our Julie Dog- your whoppie cake was perfect! It was easy and delicious! The whole family loved it! Thanks so much! My wasitline expanded as I was making this cake. But darn it is sooooo good. Where is it marked as egg free? I would have never advertised it as such, since it does include eggs. This looks great! Any tips to get the cake out of the pan neatly? It looks like you flipped them upside down? Thanks!! Make sure to grease the pan completely and yes, I just flipped it out! I made this cake for my family dinner and they just loved it. It really does taste like a Hostess cupcake, only better. It is delicious and rich tasting. Now they are asking me to make it again. Thanks for the recipe. The only problem is I don’t have a plate long enough for a sheet cake~what do you recommend ? Can I use my own chocolate cake or chocolate brownie recipe? This recipe and picture made by mouth water by just looking and reading the recipe. It has to be delicious. There is a recipe called: Death by Chocolate. I think this could be the alternate name for this recipe. Thank you from this Chocoholic. you said this cake does not have eggs, but the recipe does call for one egg. Is there a way to make it without the egg? Hi, I don’t believe I ever stated this cake is egg free. It isn’t, there is actually 4 eggs in the recipe… 3 that are required by the box cake directions PLUS one extra egg. This was DELICIOUS.I made the year-round cake. Glad I made it for someone else’s birthday and that it didn’t come home with me! I make this every year for my birthday!! I brought this to our Bible study group and it was a HUGE hit. Everyone raved about it! I added about 3/4 c mini chocolate chips to the cake batter, and I added some extra powdered sugar to the filling. I thought the filling tasted too much like butter before I added the extra powdered sugar. In hindsight, I wonder if a little vanilla might have been good in the filling. When it was all put together, the taste was amazing! If made in 2 9x9s, how long is the cake baked for? I’ve made the 13×9 multiple times…..just saying, I eat half the filling before it makes it to the cake!